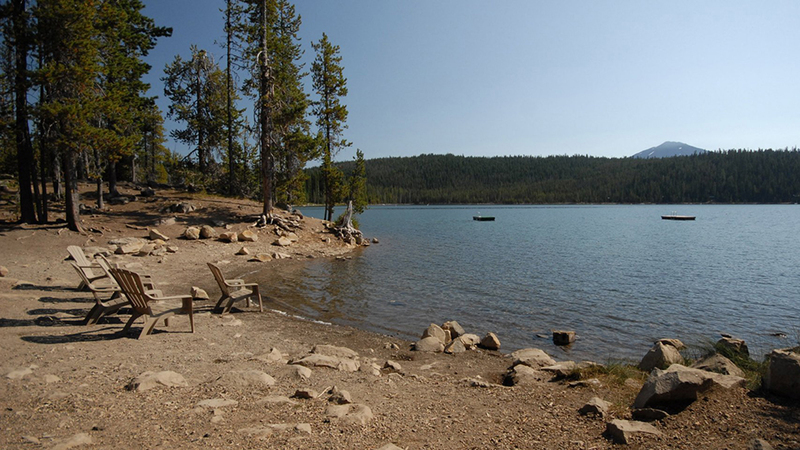 Elk Lake Campground is a small hillside campground located on Elk Lake, approximately 35 miles from Bend. Known for its transparent waters, Elk Lake is 4,900 feet above sea level and offers ample opportunities for fishing, as well as access to numerous hiking and horseback riding trails. Motorized and non-motorized boats are allowed on the lake, and during the summer months it is a very popular spot for both, as well as paddleboarders, kayaks, and canoes. There is a day use and boat launch within the campground but parking there is extremely limited. Elk Lake Campground is made up of four tent-only sites near the water and 22 camp sites with a maximum spur length of 26 feet. There is a pressurized water system and two modern CXT vault style bathrooms. Reservations are not accepted and the per night, per site fee is $14 for the first vehicle and $7 for each additional vehicle. Elk Lake Campground is typically open from mid-June through late September, but dates vary depending upon snow melt so check the web site for current dates of operation. There is cell phone coverage and the roads are paved within the campground. There is a day use area at the water front with a boat ramp.